Poly students, it’s time to get your Read On! The annual Read-A-Thon fundraiser kicks off today with the packets sent home. Fall into reading as you gather sponsors to support your reading efforts. From Oct. 16-18, students will receive raffle tickets for each new sponsor they acquire. Students choose the raffle bucket they wish to place tickets in. Primary prizes include Chuck E Cheese gift package (top pledge earner), and a $50 AMC Movie giftcard (most minutes read); intermediate hall winners receive 6 passes to the Reef (top pledge earner), and $50 AMC Movie giftcard (most minutes read). See the Read-A-Thon packet from the Oct. 11 Wednesday Watch for more information on the fabulous raffle prizes available. If students gain more sponsors after the Oct. 18 date, raffle tickets will still be provided for additional sponsors. Top earning classes in each division will receive an ice cream party, and the classes with most minutes read receive an extra recess and gummy bookworm treats. Next up, time to read on and on! From Oct. 20-27 is Reading Week; special guest readers will be featured in the gym before school begins on Oct. 24-26. After logging all those minutes, students will collect pledges from their sponsors, turning in their log and monies no later than Nov. 3. Last year’s Read-A-Thon netted $10,620. 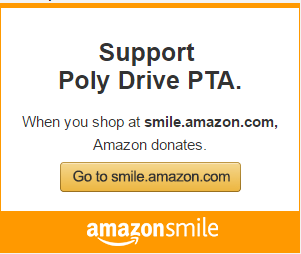 The bulk of the funds raised went toward STEM initiatives at Poly Drive, including 1:1 computing for primary grades. Funds raised will be allocated toward the 2017-18 Poly Drive PTA budget, including STEM efforts. To volunteer for Read-A-Thon, use myschoolanywhere.com online or via the app.